EMPTYBOX - RECYCLING TALES OF THE HEART. 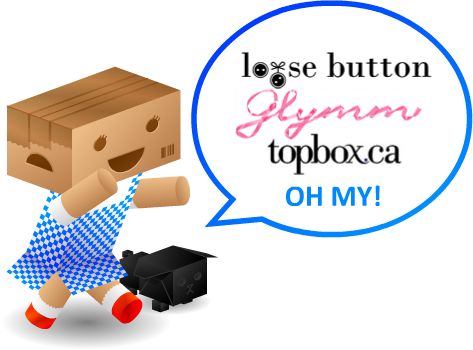 : Luxe Box & Glymm & Topbox OH MY! Similar to Dorothy, I find myself in the wonderful & mysterious world of... DELUXE BEAUTY SAMPLE BOXES!!! Imagine receiving a mystery package every month containing a random assortment of beauty products. Very mysterious and exciting! I was introduced to the service through a close friend of mine but I remember first hearing about it when BirchBox came out with the idea in the US. It took a while but the idea eventually caught on in Canada and blessed us with three sample box services. Glymm, Luxe Box and Topbox are currently the only companies that I know of, offering sample box subscriptions in Canada. Having to choose between the three was way too difficult, that I ended up subscribing to all three instead. Simply visit their website and fill out a beauty profile that will help the company customize a sample box to best match you. Randomly, every month you’ll receive a box containing 4-5 samples (with at least 1 of those being a full-size product it seems) that are hand picked specifically for you based on the survey you filled out. You can choose to subscribe for a year, a few months or just go month to month. Pricing can range from $10-$12 a month with shipping already included in the price. If you like trying new products and receiving a well deserved surprise every month than subscribe to a sample box service today!